Sr. Fructuosa was born into a truly faithful Catholic family. She had many brothers and sisters, over 10 of them. The family members were many but they were all peaceful and gentle people with beautiful and bright characters. 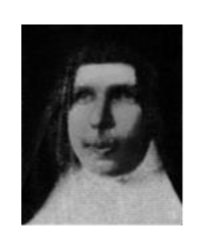 Sr. Fructuosa was tall and had a good singing voice so that she acted always as the first chantress. As soon as she arrived in Wonsan mission, she became the main nurse at the ‘Clinic of Mary the Helper’ since the position was vacant after Sr. Hermetis got sick and left for the Philippines to be cured from her illness. For 23 years, she worked with all her might for the poor children and extremely poor neighbors around Wonsan. Once when she came into contact with a very dirty baby of a poor family, she said in German to the baby, “Ah, my dear beautiful piggy, your mommy pig didn’t wash her little piggy!” and she cleaned all the dirty spots with her handkerchief lovingly and treated the baby very carefully. Not only she treated the visiting poor, but also she went around the little huts to visit those many poor sick people. She also visited the rich sick. Thus, her name was well known around Wonsan. With a great zeal for God’s mission and following our founder’s mission ideals, Sr. Fructuosa performed conditional baptisms to some 5,000 dying children and seriously ill patients. She didn’t have talent for languages and she had a difficult time learning Korean. But she made do with her good nature and social sense. When at recreation, the community members all laughed talking about something, she laughed with them happy to be with the community even though she didn’t get the meaning of the laughing matter. With the patients, she communicated with them by her diagnostic skills, love and her peaceful smiles. She never lost her peaceful composure and her prayerful trust toward God who helped her at all times. Not only the incoming patients but also the poor patients who couldn’t come to the Clinic, she went to them without any delay. She treated the poor patients and also helped them in their material needs. She never manifested any annoyance or irritation or fretting. She was always gentle and loving with a prayerful attitude toward all. From nearby or faraway, whether Catholic or non-Catholic, believer or non-believer, she accepted them all and visited them all whenever the patients couldn’t come to the Clinic. She found her medicine from the herbs in the fields and she taught patients or their family members how to find these and make medicine out of them. While she was doing her true missionary activities as a Missionary Benedictine Sister, the world changed after World War II. Korea was divided and North Korea was occupied by the Soviets. The communistic North Korean regime didn’t like what the Sisters were doing and so, on May 10, 1949, the Convent property was confiscated and the foreign Sisters were imprisoned and the Korean Sisters were chased out into the Streets. Later, the foreign Sisters and the foreign Fathers/Brothers were sent to Oksaduk hard labor camp. Sr. Fructuosa left her Clinic of 23 years and her beloved patients and people. Even then, she dedicated lovingly all the hardships to God who makes sense out of nonsense. When in PyungYang Prison, Sr. Fructuosa suffered diarrhea and edema but survived. Then, she successfully endured the Death March. In Oksaduk, she was sickly all the time but she volunteered to be the helper in kitchen and tried to be carefree and to share joyful moments with them. Then, she fell suffering a stroke (cerebral apoplexy) and received the Last Sacrament for the sick. She recovered a little. She lay in the sewing room and tried to help with some sewing. Till late in the evening she darned others’ clothes, socks, gloves, etc. There were lots to darn. While overdoing her work, she got weaker and weaker. And then, with another stroke, she quietly passed away on September 16, 1952. The community Sisters/Fathers/Brothers who were always grateful for the carefully darned gloves and socks were sure that she was admitted into heaven directly and prayed to her to help them in their hard situation. Sure enough, after Sr. Fructuosa’s death, they got somewhat better treatment from the guards. Sr. Fructuosa willingly accepted all the hardships, pains, and sicknesses, all for the love of God. Her bloodless martyrdom and the fruits of her virtuous life were offered to God as light and salt for her beloved mission people. North Korean land is still holding her blessed body in some deep mountain named Oksaduk.